SUMMARY: Confessions of an Imperfect Caregiver is the true story of a family dealing with one of the most important and fastest growing issues of our day, caring for someone with dementia. Bobbi Carducci’s life was about to change. Her ill father-in-law’s odd behavior was a mystery when he came to live with her and Mike. For the next seven years Bobbi did everything she could to save him from himself – while he tried to convince everyone that he didn’t need her and that she was crazy. THE BACK STORY: So many caregivers had posted on caregiver sites that they wished someone would write a book showing what it is really like to be a caregiver. I felt as a writer and a caregiver that I had the ability and the responsibility to write it. The research was in living it. The hard part was exposing so much information about my failings and the mistakes I made. From start to finish it took about five years. However, that was not continuous writing. I started it when my father-in-law was still alive. Caring for him eventually took all of my time and I had to set it aside. I picked it up several months after he had passed away. I thought I was ready. I was not. Reliving it was too painful and emotionally draining. I had to set it aside again. In fact, I invented excuses to stay away from my keyboard. Finally after about another year I decided it was time to carry on. It was still very hard and I cried a lot as I wrote but I feel that emotion helped rather than hindered the result. I wrote it to read like a novel so it would appeal to not only caregivers and their families but also to those who like to read books about real families dealing with difficult issues. WHY THIS TITLE? : I chose the title because there is no perfect way to be a caregiver. I call what I did, creative problem solving on the run. Sometimes it worked and sometimes it didn’t. “Brutally honest and written from the heart, Carducci’s intimate chronicle of caring for her father-in-law is a poignant story of strength, compassion, and humor that will linger long after you read the last page. Highly recommended for anyone caring for an elderly parent.” Jan Neuharth, author of the Hunt Country Suspense novels. “ … opens the door so others can get a glimpse of what goes on behind closed caregiving doors. … a testament to the poser of hope, faith, and love. There are driving forces that enable Bobbi to continue on her caregiving path despite the continuous challenges. 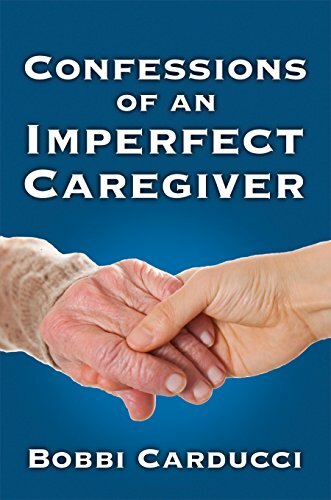 Like the millions of caregivers across the globe, she is in my opinion a most amazing – and perfectly human – imperfect caregiver.” Lunn Greenblatt, CaregivingCafe.com. AUTHOR PROFILE: Bobbi Carducci began writing at the age of eight filling notebooks with very bad poetry and fair to good short stories. After years of reading everything she could get her hands on her work began to improve. Eventually she began to like it and eventually began to believe she had talent. After joining Pennwriters, a national writers group, and attending as many workshops as possible during the annual three day conferences she began to submit her articles and short stories for publication. Bobbi is now published in newspapers, magazines, short story anthologies, childrens book and creative nonfiction/memoir. For three years she wrote a monthly book review column for About Families Publications before resigning to concentrate on writing Confessions of an Imperfect Caregiver and her blog, The Imperfect Caregiver. AUTHOR COMMENTS: Bobbi is now a caregiver advocate, caregiver support group leader and national speaker. She created and presents the program, “Prepare to Care – What Adult Children Need to Know About Alzheimer’s/Dementia” to educate as many people as possible about one of the most important and fastest growing issues of our day. Caring for one of the millions of men and women who will develop in the coming years.